June 2013 | Historic protests took place in Brazil as the country marks the one-year countdown to the 2014 World Cup. The ongoing protests in several cities stem from people’s frustrations with prevalent forced evictions, transportation increases, and the constant rise of the cost of living. 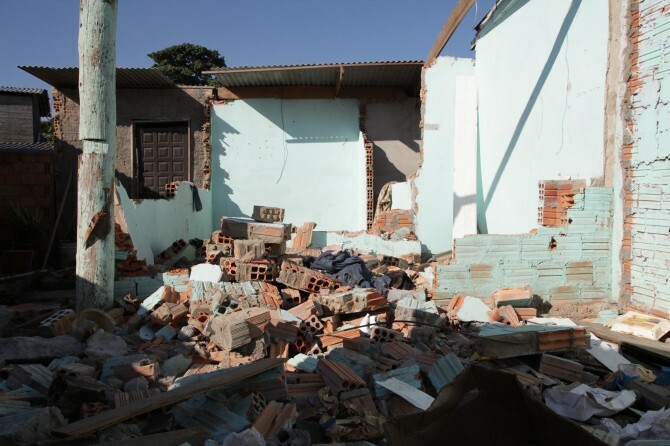 WITNESS is working with our Brazilian partners to communicate two key messages with international media; that forced evictions are representative of the types of inequalities currently bringing protested; and that the displacement caused by the World Cup and other mega events illustrates the global trends causing development-led forced evictions. With articles appearing in media outlets like the Associated Press, Reuters and The Guardian, it is clear that the international press has taken notice. While the world counts down to the 2014 World Cup, another story is being told in the People’s Cup. Communities who were likely quite excited at first about their country hosting the ultimate football tournament, today are facing costs many of us cannot imagine. Read more about the protests and the People’s Cup on the WITNESS blog.